The regal elegance of purple and gold. 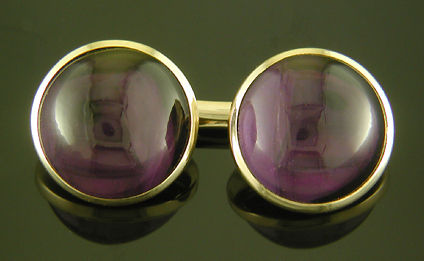 Rich purple amethysts set in brightly polished yellow gold cufflinks created by Carrington & Company. These elegant cufflinks are well suited for the occasional tippler or casual oenophile. The ancient Greeks believed amethyst jewels would protect the wearer from the ill effects of intoxication. Crafted 14kt gold, circa 1920. The reverse of these cufflinks is as well crafted as the front. Note the closed gold backs which protect the amethysts and the sturdy cross bars and tapered brackets which secure the cufflinks on the cuff. Please excuse the shadowy reflections from the camera. 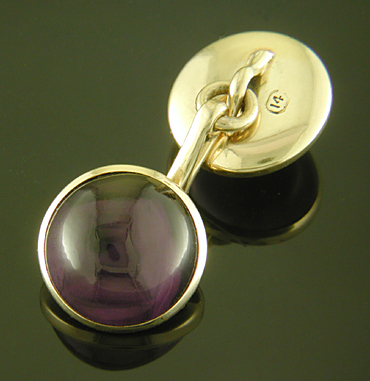 Both the polished gold and amethyst cabochons are highly reflective. 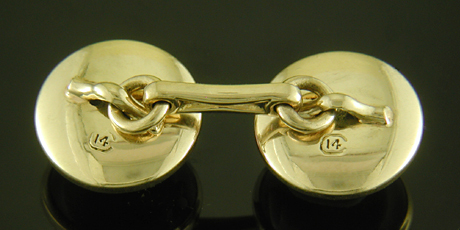 The maker's mark of Carrington & Company (a squared "C"
enclosing "14") is stamped on the reverse of the cufflinks. Carrington & Company was a maker of fine cufflinks and tuxedo sets during the first half of the 20th century. The firm worked with exceptional materials and created elegant jewels for Tiffany & Co. and other carriage-trade jewelers of the day. Measurements: These 14kt gold and amethyst cufflinks are just under 1/2" in diameter and weigh 8.6 grams in total.